Students take part in a “lie-in” on the road outside of the White House, Feb. 19, 2018 in Washington, D.C.
Another educator says “I would risk my life to save my students but I would never keep a concealed gun in my classroom.” Instead, this teacher asks for tissue and paper towels. 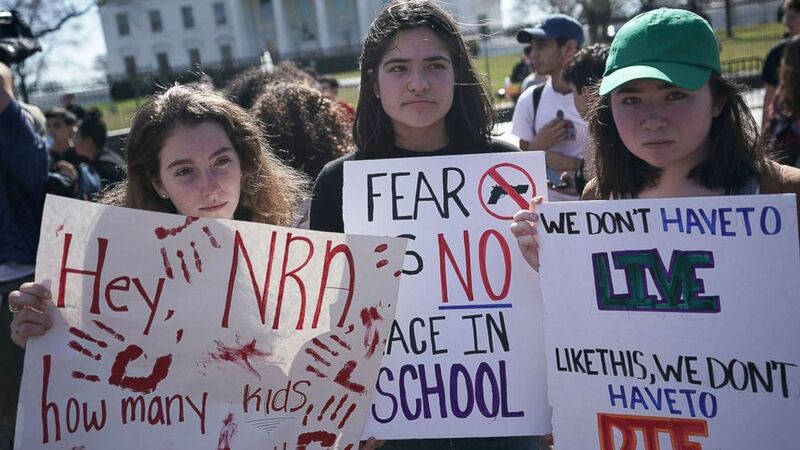 Students from the D.C. area walk out of class to demand gun control legislation at a gathering outside the White House in Washington, D.C., Feb. 21, 2018. – nationally recommended student:counselor ratio of250:1(presently at 400:1). – connections to therapists for my anxious, suicidal & lost kids. People are brought out of the Marjory Stoneman Douglas High School after a shooting at the school that reportedly killed and injured multiple people on Feb. 14, 2018 in Parkland, Fla.